Vanities. 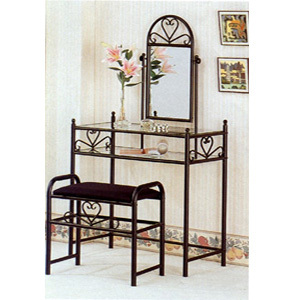 Hart Shape Motif Vanity Set In Glossy Black Finish With Two Storage, Clear Glass, Rectangular Shelves And Matching Stool With Padded Seat In Black Velour Cover. Details: Vanity: Width: 30-1/4 x D: 15 x Height: 55 Stool: Width: 20-3/4 x D: 12-1/2 x Height: 19-3/4. Strong Construction. Easy To Assemble.